Uni Posca Paint Pens are, hands down, our favorite rock painting supply for beginners. Check out why we love them, see examples of some rocks painted with Posca pens, and find out how you can get some of your own! People often ask me what kind of paint I recommend. While there are lots of acrylic paints that people can use for rock painting, I like to direct beginners to Uni Posca Paint Pens. If you’ve watched any of my videos, you’ll know that I use them a lot…like most of the time. I’m going to list the reasons why I love them so much, and why I believe that Posca paint pens are the perfect rock painting supply for newbies. 1. 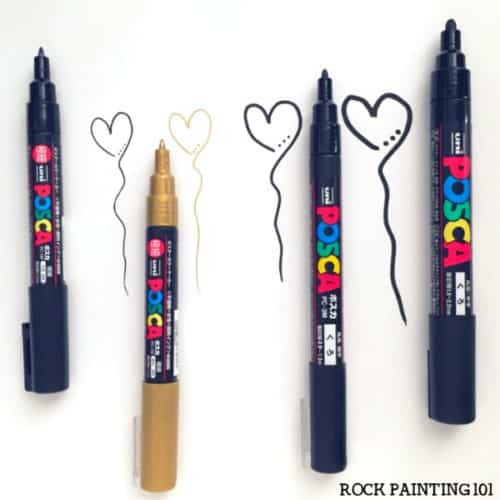 Posca pens are the only rock painting supply you need! If you’re painting with Posca pens, you really don’t need anything else! I have kids. It never fails that I get cozy in my rock painting space and a small voice calls from the other room. I’ve been painting for years, and I don’t even want to think about how much paint I’ve lost due to motherhood. I once came back to a paint pallet that I had just poured paints onto, completely dried up…I didn’t even get a chance to create with it yet! With these paint markers, you just put the cap on and you’re pretty much done! You don’t need to worry about wasting paint because duty calls. Most paint pens are oil-based paints. Since Uni Posca brand pens are water-based, any extra clean up is a breeze! On a similar note, have you ever thought that a project was going to use a lot of white…only to end up using only half the amount you poured out? Yeah. I’ve done that. A few times! But with paint pens, there is no pouring paint! So you don’t waste what you don’t use. 4. Posca pens dry fast! Because Posca pens dry super fast, you can create layers to your rock painting. 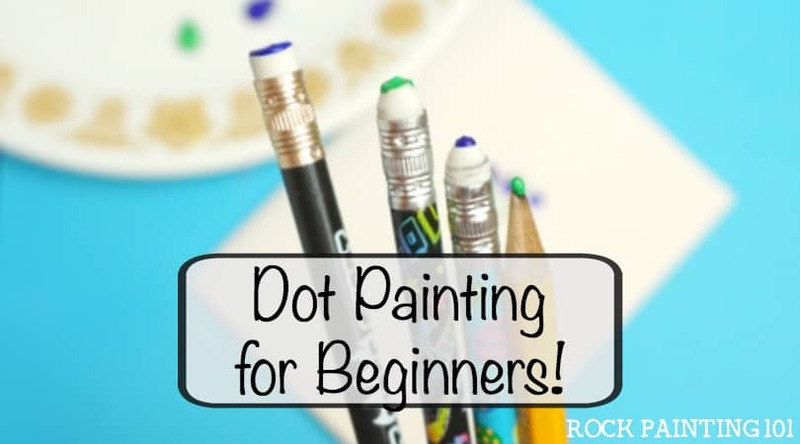 Which makes painting things like unicorns, chicks, and owls super quick and easy! It also makes these pens super forgiving. Did you mess up when painting? That’s ok! Just let the paint dry (which will only take a moment) and then paint over the mistake! 5. Paint markers make difficult rock painting techniques easy! Do you worry about creating those awe-inspiring rocks with a paintbrush? Maybe you want to write a word on a rock, and the brush just isn’t flowing. I’ve found that working with a brush can be especially difficult for dot painting or zendangles. But with a paint marker, it’s super easy! It’s almost like holding a pen! It’s perfect for every beginning design! Where can I buy Uni Posca Paint Pens? 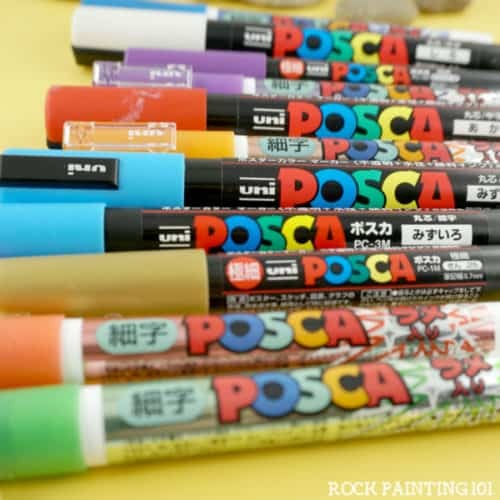 Unlike most rock painting supplies, Posca Paint pens are not usually sold in craft stores. I buy mine on Amazon. The first pack I bought was a multi-size pack that contained the 3 sizes that I use the most. Extra Fine (1M) Perfect for fine lines and small details. There are also fun colors to try! 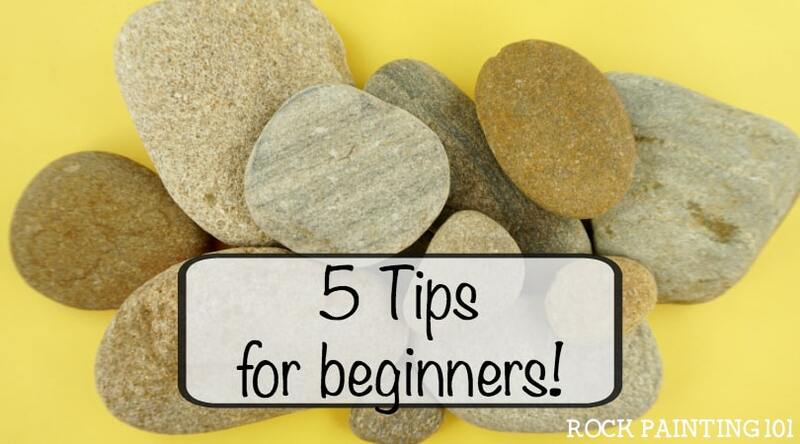 The Glitter paint pens are lots of fun and give your rocks a fun shimmer. The Pastel paint pens (they call them “natural”) are perfect for spring rocks and lighter colors. See all the pens in our shop here! 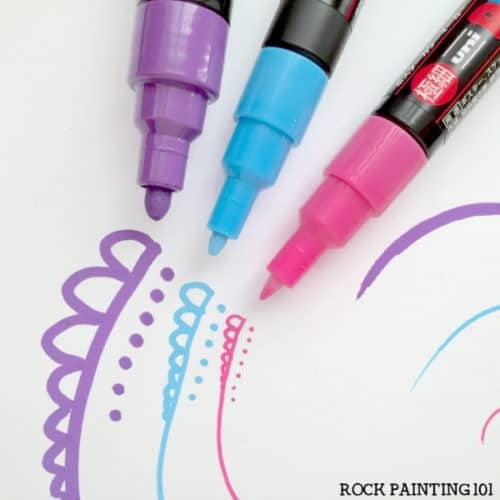 To get some inspiration, or to see these paint pens in action, check out our rock painting ideas page. It’s full of painted rocks that I used Posca paint pens on!